I wrote about apologies last January, and it seems like a good time to revisit the subject. You can find a lot of information on the internet about how (and how not) to apologize. You can find lists devoted to the worst ever apologies by public figures. Admittedly, little of what I say below is original. Still, I hope it will be useful. 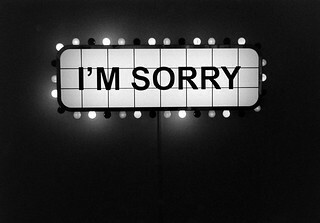 An apology that starts with the words “I’m sorry that you …” (were offended, were upset, were inconvenienced, etc.) will do nothing to repair a broken relationship. It might even make the other person feel insulted and resentful towards you. This form of apology – called the “non-apology apology” is unfortunately so common that it has its own wikipedia entry. Avoid this phrasing. At worst, including the word “if” sounds like hedging and the attempt to evade responsibility. At best, it makes you sound emotionally out-of-tune with the apology recipient. I’m sorry I offended you. [Pause] It certainly wasn’t my intention. In the first, the speaker gives the impression that he or she isn’t sure that others have been offended. There is room for doubt. If you are not sure whether someone is offended or not, there is no harm is asking. But apologise right away rather than waiting for an answer. Did I offend you? If so, I’m sorry. If you wait for an answer, you put the other person in the socially awkward position of having to say, “Yes, you offended me.” It isn’t easy for most of us to say this. It sounds confrontational. Rather than put someone in an uncomfortable position of having to tell you that you offended them, apologize if you even suspect that you might have done so. Where to start? When you say “I’m sorry but…” the part that comes after “but” negates the apology. People won’t hear “I’m sorry” because your self-justification will be ringing in their ears. There may be a time to explain yourself and to offer testimony about extenuating circumstances. The time to do this is not when you are offering an apology. The apology is supposed to meet the needs of the other person. In a proper and effective apology, one takes responsibility, offers contrition, and acknowledges the other person’s feelings. Self-justification and explanation (if appropriate) can come later. I’m sorry … but I had a really bad day. I’m sorry. I shouldn’t have acted in the way that I did. [Pause] And I want you to know that I had a really bad day at work, although that is no excuse. Finally, if you don’t feel sorry about something, don’t apologise. Most people are pretty good at detecting insincerity. A false or half-hearted apology is arguably more destructive of relationships than the lack of an apology.